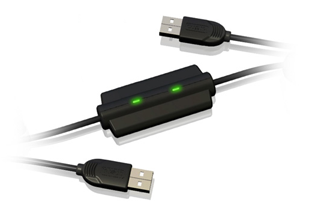 The Easy Transfer Cable is a specialized USB device for transferring data between two computers. It looks like a typical USB cable, except with a small box in the middle. This box holds the needed electronics to allow both computers to communicate with each other. The Easy Transfer Cable is USB 2.0 compliant, and allows transfer speeds of up to 480Mbps. Easy Computer Sync is designed for and requires an Easy Transfer Cable. We recommend that most customers get the Easy Transfer Cable with Easy Computer Sync, since it's the best option for transferring data to a new computer, or synchronizing data between computers. Keep in mind that this cable requires software, and will not work without software designed for it. Our Easy Transfer Cable measures 6ft in length, is USB 2.0 certified, and includes a 1 year limited warranty against manufacturing defects. For your convenience, the following Easy Transfer Cables have been tested with Easy Computer Sync. If you want to buy the cable separately, you should only purchase a cable from the list below. The Easy Transfer Cable also works with Windows Easy Transfer (for Windows Vista, Windows 7, or Windows 8). However, Windows Easy Transfer can only be used to transfer data to a new Windows computer one time, whereas Easy Computer Sync can be used both to transfer data to a new computer, and to synchronize files between computers as many times as you want. Importantly, Windows Easy Transfer is no longer supported on Windows 8.1 or Windows 10, but with Easy Computer Sync, you can continue to use the Easy Transfer Cable to transfer between any combination of computers with Windows XP, Vista, 7, 8, 8.1, 10, or higher, for both 32-bit and 64-bit versions.